« Disney Springs Grand Opening Summer Celebration Now Underway! In a galaxy not so far, far away, a spectacular dessert party has gotten even better! At the Star Wars: A Galactic Spectacular Dessert Party at Disney’s Hollywood Studios®, you can experience out-of-this-world desserts and drinks inside Star Wars Launch Bay. Here, you can become immersed in the Star Wars universe with photo opportunities, exciting exhibits and thrilling character encounters. After enjoying an assortment of sweets — including themed cupcakes, cookies and brownies and a selection of savory snacks including cheese and flatbread and dip (as well as alcoholic and non-alcoholic beverages) — you will be escorted to a VIP viewing area for the Star Wars: A Galactic Spectacular. Dessert party check-in takes place in front of Star Wars Launch Bay, located in the Animation Courtyard at Disney’s Hollywood Studios. Check in begins at 7:30 p.m., and Guests can enter the party at 8:15 p.m. The cost is $69 for adults, $39 for children age 3-9. 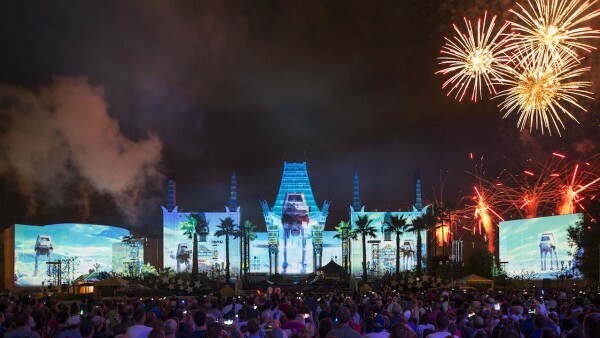 Admission to Disney’s Hollywood Studios is required to attend, and is not included in the price of Star Wars: A Galactic Spectacular Dessert Party. This entry was posted on July 13, 2016 at 3:02 pm and is filed under Disney News, Disney Vacation Planning, Hollywood Studios, Special Events, Walt Disney World. You can follow any responses to this entry through the RSS 2.0 feed. You can leave a response or trackback from your own site.